Books and music published in Germany before 1945, performance, limited-edition video, sound composition, series of self-shot photographs. There is a fetid whiff of the Bush/Cheney reign of error emanating from a huge video projection on view at CiFo. Jimmie Durham's Smashing offers a stinging commentary on bureaucratic arrogance and ineptitude. It's rife with Kafkaesque undertones that seem ripped from recent headlines bemoaning the crushed American dream. 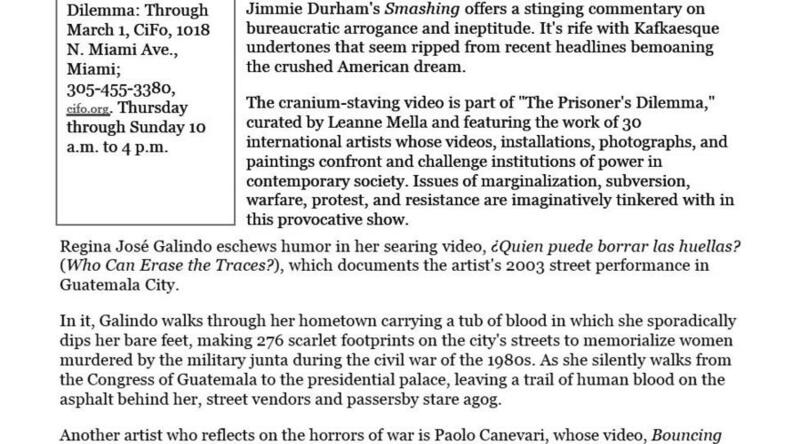 The cranium-staving video is part of "The Prisoner's Dilemma," curated by Leanne Mella and featuring the work of 30 international artists whose videos, installations, photographs, and paintings confront and challenge institutions of power in contemporary society. Issues of marginalization, subversion, warfare, protest, and resistance are imaginatively tinkered with in this provocative show. In Durham's 92-minute video, a doltish government functionary, sporting a business suit and an unruly Beethoven coif, sits behind a metal desk in a cinder-block room. The austere setting appears more suited for nasty interrogations than for an above-board execution of official business, perhaps hinting at the shady machinations at the Guantánamo detention camp. Like blinkered sheep, men and women approach the dysfunctional functionary and offer their worldly possessions. Each person appears alone before the oaf, handing him an object he perfunctorily destroys with a huge stone before removing a document from a desk drawer. The government lackey then grabs a pen from his suit pocket, signs the form, and rubber-stamps it with a crude air of authority before imperiously flinging the receipt at his silent victims. He never ventures a glance at those who cower nervously before him as he mindlessly repeats his actions over and over. As people come and go, the dolt, with jackhammer precision, dispatches bags of flour, computer keyboards, ceramic figurines, and a guitar. The addled civil servant then furiously drops his rock on what appears to be a jar of pasta; the sauce spatters onto a wall like blood. Regina José Galindo eschews humor in her searing video, ¿Quien puede borrar las huellas? (Who Can Erase the Traces? 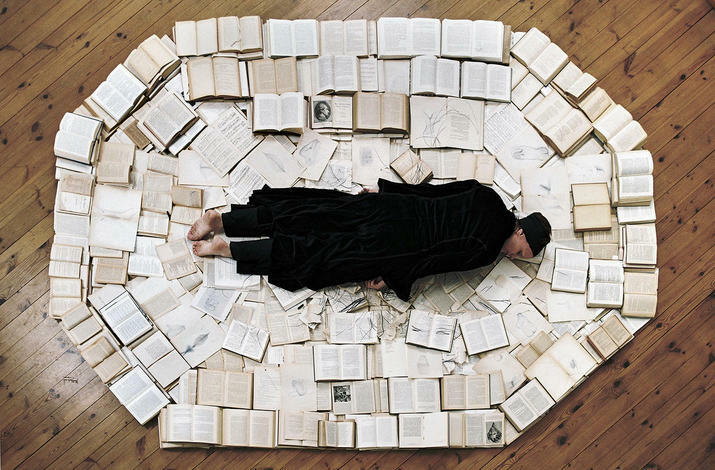 ), which documents the artist's 2003 street performance in Guatemala City. In it, Galindo walks through her hometown carrying a tub of blood in which she sporadically dips her bare feet, making 276 scarlet footprints on the city's streets to memorialize women murdered by the military junta during the civil war of the 1980s. As she silently walks from the Congress of Guatemala to the presidential palace, leaving a trail of human blood on the asphalt behind her, street vendors and passersby stare agog. Another artist who reflects on the horrors of war is Paolo Canevari, whose video, Bouncing Skull, was shot outside the destroyed Serbian army headquarters in Belgrade. The ten-minute work depicts a solitary lad displaying some nifty soccer footwork with the rubber likeness of a human skull amid the bombed-out surroundings. As he passes the bouncing skull from foot to foot, it brings to mind the grisly scene at the end of Eli Roth's film Hostel II, in which young boys gleefully kick around a woman's severed head. 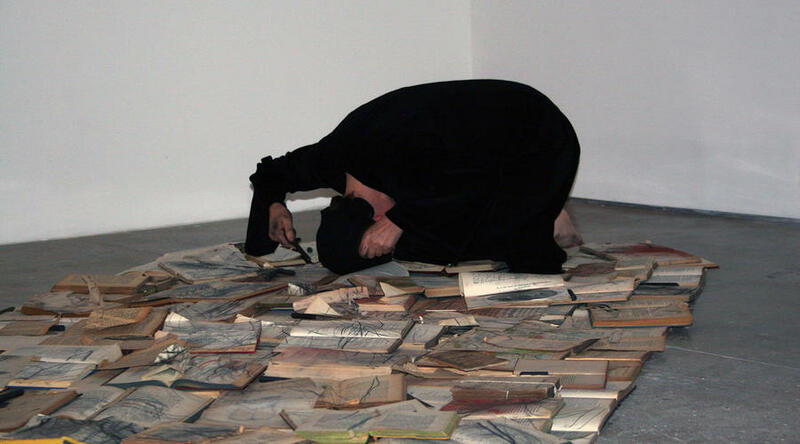 Equally powerful is Phlegethon-Milczenie III, a sculpture, video, and sound installation by Poland's Monika Weiss. Situated in a corner of the gallery, the piece includes scores of books whose pages lay open and scrawled over with charcoal, jutting outward triangularly across the floor. Above them, images of flames burst upon the walls as the woeful lamentations choke the air. 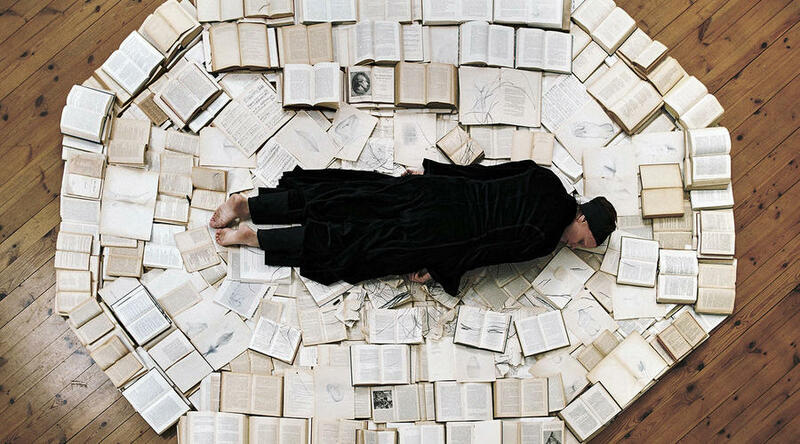 In the video, a woman lies across a pile of books and draws solitary human figures. Many of the books represent German literature published before World War II that the Nazis torched during the Holocaust. seems to be the subject of Cuban artist Alexandre Arrechea's two watercolor-and-pencil drawings rendered in sparse monochromatic hues. El espacio alterado (The Altered Space) depicts a camera peeking out from under a closed elevator door. In Untitled, from the series Garden of Mistrust, surveillance cameras snake out from inside a pair of rusted oil barrels, symbolizing the West's dependency on Middle Eastern oil and the global tensions arising from the U.S. invasion of Iraq. arresting gelatin silver print photo, in which a large group of women is huddled en masse with hands held up, facing the viewer. Untitled (Rapture Series) depicts the women veiled in chadors, with Arabic writing on their palms, as they sit herded in a desert sprawl. The boot prints of unseen adversaries surround them in the sand. In another photo from the same series, a group of men, who might be praying, is shown at a seaside fortress, crouching in concentric circles as they face each other with their backs to the spectator. Behind them, an ancient cannon points to the ocean. These images are suffused with a sense of beauty and mystery that's difficult to describe. Near the exit, Priscilla Monge's color photographs strangely evoke the 1968 Manson murders. The artist has scrawled six impeccably white doors with similar phrases in blood. One reads, "El arte es cosa de vida o muerte" ("Art is a matter of life and death"); another reads, "La guerra es cosa de vida o muerte" ("War is a matter of life and death"). It's impossible to argue with either sentiment, especially when confronted with a show that so potently mirrors these uneasy times.